FROM DR. LUKE’S FAMILY MEDICINE What’s important to you is what is important to us. 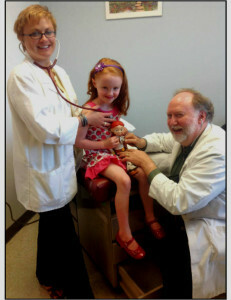 Oftentimes, little ones who need to see the doctor are afraid until they find the warmth and caring atmosphere at Dr. Luke’s Family Medicine. Let’s face it, it can be a little scary and stressful for adults, too. Ava Watson, pictured right, was pretty scared when she fell in the park and split her chin wide open. But after applying the “magic” numbing cream, she didn’t mind the needle that infiltrated the wound. She couldn’t even feel us sew her up. What was important to her is that we took care of her doll, and that made her happy. Not only has Dr. Luke’s office provided professional, top-notch medical care for 20 years, but with the addition of Family Nurse Practitioner Stephane Counts, we provide same or next-day care for minor emergencies that used to mean a long trip to the emergency room. Now your urgent needs can be accommodated efficiently and you can enjoy the followup care of your own personal family medical provider. In addition to taking care of what’s important to you during our office hours from Monday through Friday. This applies to vacationers, people staying in hotels, locals and commuters. “I love going to work every day,” Counts said. “It’s rewarding and fun … like being with people you love and taking care of people you come to love.” Medical Assistant Rochelle Mings said she also loves her job. “I get to learn new medical skills and improve what I already know,” she said. “I assist in minor surgeries, give shots, perform (electrocardiograms, impedance cardiography), pulmonary function tests, biopsies, diabetic education and more. “Most of all, we comfort patients’ fears, help relieve pain, restore hope and share lives with people we come to love.” Dr. Luke is short for Dr. James P. Lukavsky, board-certified family physician. “I’ve come to believe that God writes straight with crooked lines,” he said. “It didn’t take me very long to find out that God’s plan for me was perfect. I love doing what I’m doing. “What may make me unique is that I know that being a doctor was not of my own doing. And therefore it is with humility that I am honored to practice medicine. “I believe that Stephane Counts has that same humility and honor when she approaches patients. And therefore I am very happy to have her working alongside me in our office.” We are just a part of what makes up Doctor Luke’s Family Medicine. We are located on Branson’s medical mile on Missouri 248 at Castle Rock Plaza next to Mercy medical clinics. For a new medical care provider who cares or for minor urgent care, call 417- 337-7511 Monday through Friday. © 2019 Dr Luke's Family Medicine LLC. All Rights Reserved.